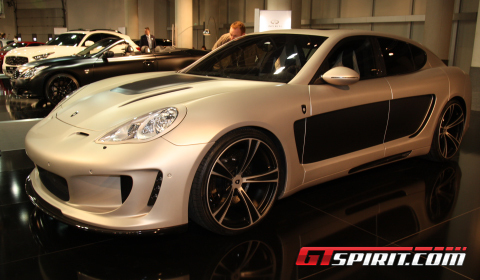 German tuner Gemballa has officially released their tuning program for the Porsche Panamera. The Gemballa Mistrale is a true Gemballa product with several new design influences and a body kit completely made of carbon fiber. The body kit replaces every single part of the standard body work leaving the roof and the rear trunk untouched. The Gemballa-style exhaust tips and signature side panels are easily noticeable. Same goes for the massive 22 inch wheels and the new vertical daylight running lights at the front. The interior also received a massive upgrade using the standard setup and seat configuration of the stock Porsche Panamera. The first stage of power upgrade for the twin-turbo V8 engine provides 610hp for the Panamera/Mistrale. The latter conversion is accompanied by a healthy 850Nm of torque. Really power hungry customers can opt for Stage 2, which gives the luxury saloon 700hp, and around 1,000Nm of torque. This output is achieved through the use of larger turbochargers, a modified intake system, high efficiency intercoolers, sports exhaust, free-flow catalytic converters and bespoke ECU remapping.